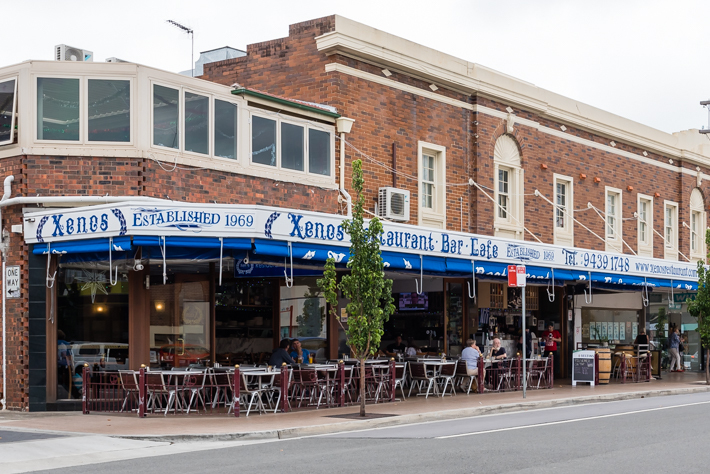 Welcome to Xenos Restaurant, Bar & Cafe here in the heart of Crows Nest! 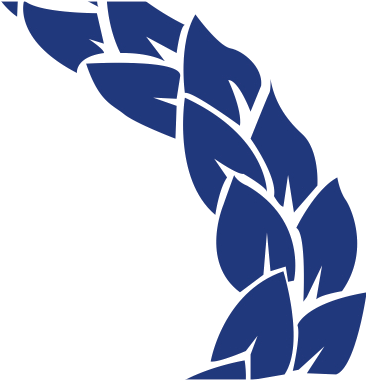 We’re family owned and operated and have been specialising in Greek and modern Australian cuisine since that special summer of 1969. We take pride in our status in the Sydney community, and we are the very first al fresco dining spot in the area. We’ve seen a lot over the years, yet we’ve always made sure everything we serve is of the highest quality. We’ve got an extensive menu here, with plenty of meat, seafood and vegetarian dishes and are open for breakfast, lunch and dinner seven days a week. So come and see us – Katy, Peter, Tim and Dennis – for some good food, wine and company. We can’t wait to serve you here at Xenos on Burlington Street. store for our current pricing. 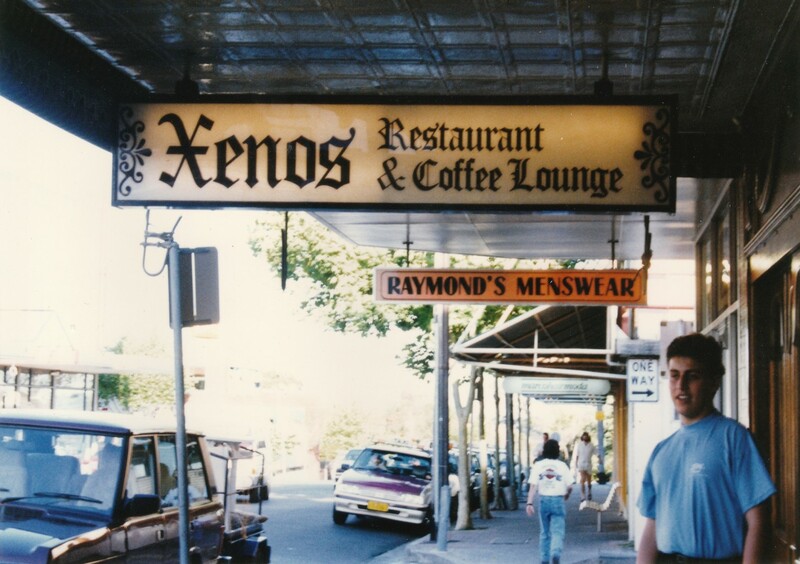 Xenos was established by Peter and Kathy Xenos in 1969. 1969 – 1979 The business was a milk bar with linoleum floors, orange vinyl booth seats, 8 white laminate rectangular tables with a small silver star pattern on them. The bar area was always lined with lollies and chocolates especially at Easter and Christmas. The only breaks in the continuous confectionery counter were for the enormous bell shaped juice dispensing machine, milk shake machine and espresso coffee machine (old fashioned manual pull down type). The kitchen hardly rates a mention because of its diminutive size but still managed to produce amazing burgers, rissoles, fried fish and hand cut chips and of course those amazing waffles among other marvels. 1979 – 1993 Peter saw that the days of the Milk Bar were numbered and so transformed it into a Coffee Lounge Restaurant. It had wooden sliding front doors with sand blasted glass inserts, wooden Corinthian columns marking the entrance into the dining area. The dining room consisted of 8 booth tables and one standalone table. The seats were shiny red vinyl with brass buttons. The tables were stained and polished solid hardwood. The walls were lined with banks of tinted mirrors with golden veins running through them indiscriminately. The high ceiling had exposed wooden beams with red suede infill and three chandeliers. The bar area was entirely wooden except for the glass shelves and mirror backing. Highlights were a hot food bar, sandwich bar, milk shake machine (same old one) and new espresso coffee machine. The kitchen became twice as big but still managed to produce the same old favourites with some new ones. These included lambs fry, chicken calvados, steak Dianne, grilled whole lemon sole and different soups and roasts every day. Some Greek dishes became permanent fixtures on the menu with Moussaka, Beureks and Souvlaki. Other Greek fringe items had a cult following but were yet to hit the mainstream (octopus, egg-lemon soup etc.). 1993 – 2008 The “recession that we had to have” hit Crows Nest hard. Businesses were suffering everywhere. What was needed was a revolution to spark new life into the area. With that in mind and a firm belief that outdoor dining was the way to go, Peter began talks with local authorities on the topic of eating outdoors in the late 80’s and early 90’s Revolutionary …….”Eureka”…….Alfresco Dining in Crows Nest. They had been doing it around the Mediterranean for over three thousand years so it’s not quite as revolutionary as say sliced cheese. However it was definitely what the public wanted as you can see today by the number of eateries in Crows Nest that offer outdoor dining. So it was in 1993 the Cafe Restaurant was born with the outdoor dining area. The next door shop was also annexed to create a larger dining room and the kitchen was expanded again by twice its size. There were many new elements in this expansion including the full time involvement of Peter’s and Kathy’s sons Tim and Dennis. In the dining room the booth seat elements remained in the form of a wraparound bench seat. Parquetry in a herringbone pattern on the floor and Tuscan birds-eye veneer lined the walls with large rosette framed mirrors making the room seem larger and allow more light. Glass highlights are apparent with large glass windows facing North and textured glass wall lights matching a glass cloud, with a relief of Zeus catching the eye, hanging from the ceiling. The hexagonal glass cake cabinet displays divine decadent delights while the glass antipasto counter had a variety of more savoury offerings. The bar is black granite with strips of brass and veneer. The espresso coffee machine also grew in stature and the good old milk shake machine was retired from service with a new all stainless steel one as its replacement. Glass shelves lined the mirrored walls of the bar and they were stacked with, what seemed to be, every glass receptacle known to man. After 1996 when a liquor license was obtained and Tim became the Licensee, liquor was added to the fray. The kitchen was lined with floor to ceiling stainless steel and another kitchen was added upstairs in 1996 to cope with the demands being placed on the chefs due to the upsurge in popularity. In 2006 the outdoor dining area was enlarged after much deliberation and red steel barricades were erected outlining the alfresco area and adding charm to local streetscape. The standout dishes were barbecued baby octopus, traditional veal schnitzel, whole and fillets of fish, 1kg Emerald Hills T-Bone steak, Moreton Bay Bugs and Jumbo King Prawns in a white wine cream sauce, Slow roast Greek lamb and of course lamb souvlaki. Present Once again the next door premises was added to give the kitchen and bar twice more space. Plastic curtains and heaters were introduced to the outdoor area to allow patrons to sit outside when the weather was “Melbourne-Like”. Folding doors give the new premises more natural light and allow the different areas to merge gracefully. The new open kitchen gives patrons front row seats to the ‘theatre that is cooking’. The old blackboard specials were now changed via laptop computer and the blackboards became Plasmas and LCDs. Most of the interior dining room elements were kept however the outdoor furniture was replaced with designer chairs from Italy and white stone-top tables. The wine list was expanded and the number of wines by the glass doubled. Cocktails were added to the newly expanded Italian Marble bars repertoire and the caffeine addicts got their own bar for sipping their cup of Vittoria Coffee whilst catching up with the day’s news.